Posted by gordonwatts in Energy, ITER. I’ve done two Science Café’s. If you don’t know what they are, I definitely suggest you lookup a local schedule. They are fantastic, and done all across the USA. There I’ve talked about particle physics, and the Higgs. But last night I went way out of my comfort zone and joined two other UW physicists to talk about ITER. Anna Goussiou, who does the same sort of physics I do, and Jerry Seidler and I all traveled to Shanik. It all started when the owner of Shanik, Meeru, got very excited reading an article in the March 3’rd New Yorker called Star in a Bottle (it is available online). It describes the history of ITER and its quest for cheap clean energy. This nicely dovetailed with two of Meeru’s (and many other peoples) interests: the environment and science. Meeru then went looking for a way to share her excitement with others – which is how I and Anna and Jerry ended up in her bar with about 40 people talking about ITER. We got free food. If you are living in Seattle, I definitely recommend visiting. Amazing food. As some context, check out the Livermore energy flow charts (from Lawrence Livermore National Lab). I’d not heard about these before. Click on the link, and check it out. It shows all the sources of energy (solar to petroleum) and how they are used (transportation, residential, etc.). One very nice thing: the total units add up to almost 100, so you can almost directly read the numbers as percent’s. And when it comes to bettering the environment we need to eliminate quite a chunk of the energy source. The hope is ITER can help with that. What is ITER? Jerry made what I thought was a great analogy. We have the nuclear bomb, which we have harnessed for peaceful purposes in the form of a nuclear reactor. Bomb to electricity. ITER, and other fusion based research projects, are attempting to harness the H-bomb (hydrogen bomb) for peaceful purposes in the same way. Unlike a nuclear reactor, however, the radiation is going to be minimal. It will not have nearly the waste problem that a nuclear reactor has. Frankly, I didn’t know much about ITER when this whole thing started. But the concept is pretty simple. You start with one of the major seed reaction in a star. You start with deuterium and tritium – both different forms of hydrogen (isotopes). If you can get them close enough to “touch”, they will bind to for Helium, an extra neutron, and a boat-load of energy. If you can capture that energy as heat, use it to boil water, then you can produce electricity by using the steam to run a turbine. The devil, however, is in the details. 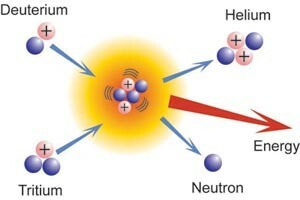 First, it takes a tremendous amount of force to get the deuterium and tritium close together. In the case of an H-Bomb a nuclear bomb is used to accomplish this! Obviously, you can’t blow up nuclear bombs in the middle of ITER! Second, when it starts to burn it is hot. Center of a star hot! Pretty much nothing can contain that – everything will melt! The ITER project, under construction now, thinks it has solved the heating problem and the confinement problem. ITER, big science, is very much that: a science experiment. There are decades of research that go into it, but there are some very real problems that remain to be solved and they can’t solve all of them until they build the machine and try it out. But lets say the machine works. What would it take to displace some of the dirtier forms of energy? It comes down to price. The fuel for an ITER like power-plant is going to be cheap. Very cheap. But the upfront costs are going to be high. The reactor is a serious bit of tech. The current ITER project is probably going to cost of order $20 billion USD. If it works, the second one will be much cheaper. This is very much like a nuclear reactor. The fuel, uranium, is very cheap. But the plant itself is quite expensive. Guesses put the cost higher than current fossil fuels, but not much more expensive. The current ITER project is also fascinating to me for another reason: it is a giant collaboration of many countries. Just like CERN, and my experiment, ATLAS. Only, ITER looks like it might be a little more dysfunctional than ATLAS right now. On the bright side, CERN did put together the world’s largest experiment, and it worked. So it should be possible. Last thing I wanted to mention was the cost. This is a big international project. Many countries (including the USA) are involved. And because of that there are some big issues. Each country is trying to reduce its cost and a local decision can affect other components in ITER generating a ripple effect – and delays and cost overruns (of which they have a lot). Could one country build ITER? Lets look at the USA. We have successfully run a few really big projects in our past – the Manhattan project and the Apollo program come to mind. These were each about 1% of GDP. The USA’s current GDP is about 16 trillion. 1% of that is about 16 billion per year. ITER could be built for about half or a quarter of that per year, given it was a 20 billion dollar project, and it would take about 4 or 5 years to build. So if you considered clean energy efforts like this of similar importance to these other projects, the USA could totally do it. Another sense of the scale of the project: the financial bailout was $780 billion or so. I have only one thing to say. Write your congress person and urge them to support all sorts of science research: be it ITER, solar power, or anything else. But get involved!